Stay warm and cosy with a coat styled just for your figure! 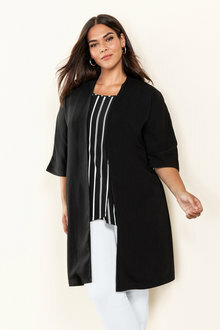 At EziBuy, we have a range of plus size coats online. Shop jackets and coats in a variety of colours, patterns, styles, and fabrics online today. When the cool temperatures hit, it's no big deal if you have a comfortable coat you feel confident in. Feel free to browse our Winter Fashion Guide for the latest winter trends and tips. At EziBuy, we have a range of plus size coats online designed for sizes up to 26. You'll feel snug and confident in one of our plus size range. We've got everything from plain knit jackets to checkered coats. Choose from a variety of lengths and styles to find your signature look. 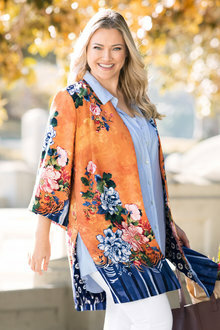 Coats with shorter hems go wonderfully with A-line and flared skirts, while a longer coat looks fabulous with some plus size pants. 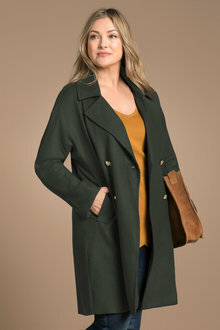 Check out our full range of plus size coats online today at EziBuy and rug up warm this winter!